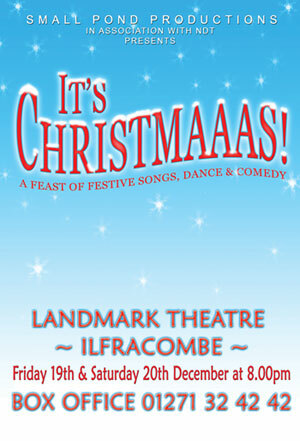 It wouldn’t be Christmas in Ilfracombe without a festive show at the Landmark Theatre. After last year’s smash-hit production of The Vicar of Dibley, this year Small Pond Productions presents It’s Christmaaas, a home-grown mix of song, dance and comedy for the whole family on Friday 19th and Saturday 20th December. Book your tickets today by calling the box office on 01271 324242 or book online at www.northdevontheatres.org.uk. All tickets £9. Posted in performance. Tagged with Christmaaas, Devon, Ilfracombe, Landmark, Theatre.